Horse trials can take place over one, two or three days. Be sure to check the Omnibus for the show schedule ahead of time. If you are stabling overnight, make sure you’ve packed all your stable management supplies including buckets, feed, hay, shavings and a stall card with your contact information. If you plan to haul in for the day, make sure to pack water as many venues may not have easy access to fill up. First things first. Head to the secretary’s office to pick up your packet. Your packet will have your bridle number, pinny number, program and map of the cross-country courses. Your bridle number must be worn in every phase as well as when walking or grazing your horse, so they can be identified. If you are competing in a one-day event and you live within easy driving distance, it is a good idea to walk your courses the day before. Typically, the cross-country course opens at 3:00 p.m. the day before the event, but double check on the Omnibus listing! Arrange time to walk the course with your trainer, but it is also advised that you walk the course alone a few times as well. Keep walking until you can go through the entire course in your mind including fences, footing changes, turns, etc. You’ll want to make sure you and your horse are perfectly turned out come show day. Your appearance is the judge’s first impression before your test, so make sure you leave a good one! Make sure your horse is bathed and clean. It is also customary for eventer to braid their horse’s manes for dressage. Your own clothes and your horse’s tack should be clean and professional looking. Your first event can be stressful, so giving yourself a schedule for the day may help. The best way to plan for each phase of competition is to go from your ride time and work backwards. Make sure you factor in plenty of time for braiding, getting dressed, grooming, tacking up, walking to the ring and warm up. It’s helpful to also give yourself an extra 15 minutes in case something comes up. It’s better to be early than late, ride times do not wait on you. If you miss your ride time, you may be eliminated. When you get to the warm-up ring, check in with a steward to let them know you are present. They will also check your spurs, whip and bit to make sure they are in accordance with the rules. They will also let you know which ring you will ride in, and which noise your judge will use to signal you into the ring when it’s time for your test. It might be a whistle, a cowbell or a car horn. Now is also a good chance to ask the steward if the show is running on time. It’s helpful to have someone on the ground in the warm up to help you with any last minute duties like wiping dust off your boots. They can also help make sure you get into the ring at the correct time, so you can focus on your riding. When it’s finally your turn, the rider ahead of you will halt and salute, and then you may proceed around the outside of the area. This is your chance to show your horse anything they may find scary, like the judges tent or car, arena letters or banners. Once the judge signals, you have 45 seconds to enter the ring. Don’t worry, take a deep breath and focus on your test. After you halt and salute, exit the ring at a walk. You’ve completed the first phase! Most events offer live scoring, so you should be able to see your result online very quickly. About an hour after your test, head to the secretary’s office to check the official scoreboard and pick up your dressage test which is filled with the judge’s comments. Read carefully, you can learn a lot which can help you improve your scores! 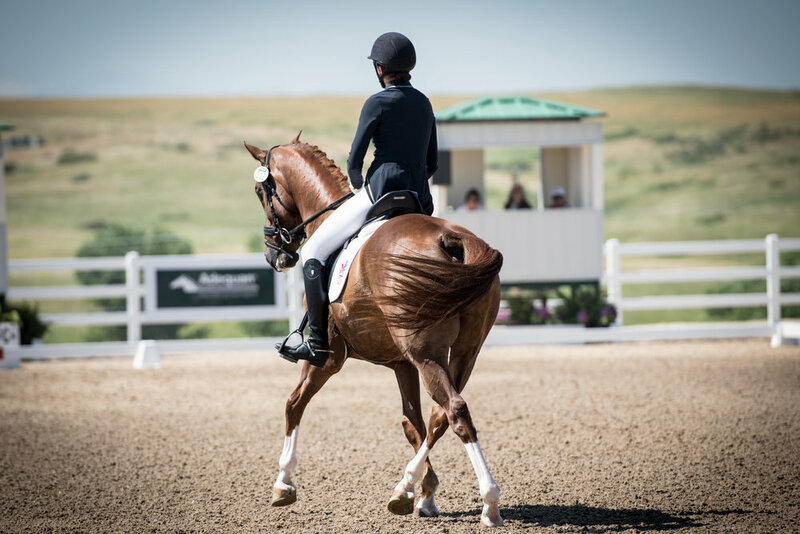 After dressage, plan your schedule again based off your cross-country ride time. When it’s time to ride, double check that you’ve got your number in your pinny holder and that you’re wearing a medical armband or bracelet. Again, check in with the warm up steward. In warm up, there will be at least a crossrail, vertical and oxer. Many events also have a few cross-country fences, but make sure you jump everything with the red flag on the right and white flag on the left! After you cross though the finish flags, slow your horse and then dismount. Next, head back to the barn and perform your usual cooldown routine. Be sure to discuss with your trainer what method is best for your horse beforehand. Before your show jumping round, be sure to double check the course maps as the ring often changes for each level. Events leave a short window for course walking between each level change, so if you can, schedule with your trainer so you can walk your course as it is set for your division. Again, check in with the steward at warm up. Like in previous phases, they will let you know when your turn is coming up. Pay attention so you jump the warm-up fences with the red flag on the right and white flag on the left. The steward will signal when it’s your turn to head into the arena. Enter and find a good spot to salute to the judge. They will then ring a bell and you will have 45 seconds to get through the start timers. Be sure not to begin before the judge rings a bell. After you finish, slow your horse to a walk or trot and leave the arena. Then, pat your horse and then yourself because you’ve finished your first horse trial!